I applied for both the Double Dipsea, now hosted by Brazen Racing, and the regular Dipsea since I was pretty sure I wasn't going to get into the latter. Surprise! I somehow managed to get into the second oldest (oldest trail) race in the United States and coveted by Mill Valley and many other runners. Then, I had that head-slap moment when I realized not only was I running two Dipsea races in a month but I had never run ANY of the marine headlands and no clue what I was in for. Thus began my investigation and eventual Double Dipsea training run one week prior to the Dipsea! I knew that The Dipsea is considered an 'Open' course where in theory you can use any route from start to finish and that the race is handicapped based on criteria such as Age. However, 'short cuts' are only allowed IF you know them and don't violate any of the regional park rules, etc. In other words, you better know the short cut well or don't take it lest you get lost or DQ'ed. I needed to find an experienced Dipsea runner and fast! I solicited FB trail groups around the Marin area and was lucky to find not only knowledgeable trail runners, but friendly and willing to show a newbie around. Specifically, Leigh-Ann and Eduardo from 'NorCal Trailheads (mentias adventum trekkium) offered to help and I ended up running with Leigh-Ann because Leigh-Ann started later and at a non-suicidal pace I could maintain. We agreed to meet at the Old Mill Park entrance on Throckmorton Ave at 7:30AM and sure enough Leigh-Ann arrived and was waiting 7:30AM. Downtown Mill Valley parking is metered (2hr and some 4 hour) but outside the park is first come, first served all day. I got there 15min early and managed to secure a spot right by the entrance. Not sure what I'm going to do on race day other than get there hours ahead of the race start. We waited for one other runner a Triathlete named Chris then off we started. It should be noted that at the park entrance is a restroom and water fountain. What more could a runner ask for? Lush plant growth! OMG there are redwoods, ferns, lichen and basically green everywhere. In the East Bay we get about a month of green around St Patricks day then the rolling hills turn brown. Incredible running weather! It started about 54 degrees and warmed up to about 60? We started on the Mill Valley (MV) side with partial sun but by the time we got up to about 1000 ft we were in the clouds with condensation forming rain drops that would rain down tree leaves but not quiet making the earth. On the Stinson side it was a bit windy with mist and felt great. In the East Bay at this time we are at least 10-20 warmer. Beautiful redwood trees! OK that's plant/tree growth, but redwood groves are just in their own special category. There are three 'short cuts' that are not well marked, barely suggestions of a trail between bushes and very steep : Suicide, Swoop and Panoramic. IF whilst running Dipsea I see other runners taking these short-cuts and the short-cuts are not backed up relative to the main route I'll take them. That's a lot of IFs. In general, it is not recommended that newbies take the short-cuts. I didn't take pictures of where the short-cuts are as there are DVDs and other write-ups on just short-cuts. There are two water fountains at mile 2 and 4 that will allow you to carry just a handheld. However, at the time we did our training run the water fountain at mile 2 (at Muir Woods parking lot) was out of service. Luckily, the bigger fountain at mile 4 was in service. The water fountain literally at the peak marks the halfway mark and I was able to get these great shots on the way down to Stinson beach. I must say another treat is running on soft ground through redwood trees. The smells, sights and sounds are intoxicating. Once we made near Stinson Beach after roughly 1:45 hours we took at 5 min rest to fuel up then turned around and went back. Mind you this is reverse of the actual Double Dipsea which will start at Stinson Beach and turnaround at Old Mill Park in MV. Here is the sign you'll see before going back that simply reads 7 miles till Mill Valley. I forgot the name of the bridge but there is a nice small reservoir and stream (brook?) running down from the hills. Now back up the stairs we just ran down. Stairs, stairs and more stairs. There are sections that are relatively wide with very soft path, then there are other sections that are very narrow with exposed rock and branches. Watch out. Not the time to 'zone out' with earphones on. In fact, I actually can't imagine how this is going to work on race day packed with runners angling for better position. Nope. After you get to about mile ~13 you get to run down all those hundreds of steps you slogged up. Now a point on this. You may see 'locals' taking 2 to 3 steps at a time down. Be very careful. The stone steps are very slippery and the wooden ones are not very deep and it would be very easy to misjudge a step to your peril. I'd recommend taking them one at a time unless you have practiced 2/3 at a time. Yes, you the newbie will be slower so just stay to the right. My total running time for Double Dipsea training run was about 3:22 hours, covering 4314 ft of elevation gain over ~13.6 miles. We actually didn't start down town so our 'run' was slightly shorter. Dipsea is a beautiful hike that all families should do. Dipsea is a challenging run experience that runners should make after they've done hill repeats, gained trail running experience and worked those cores! 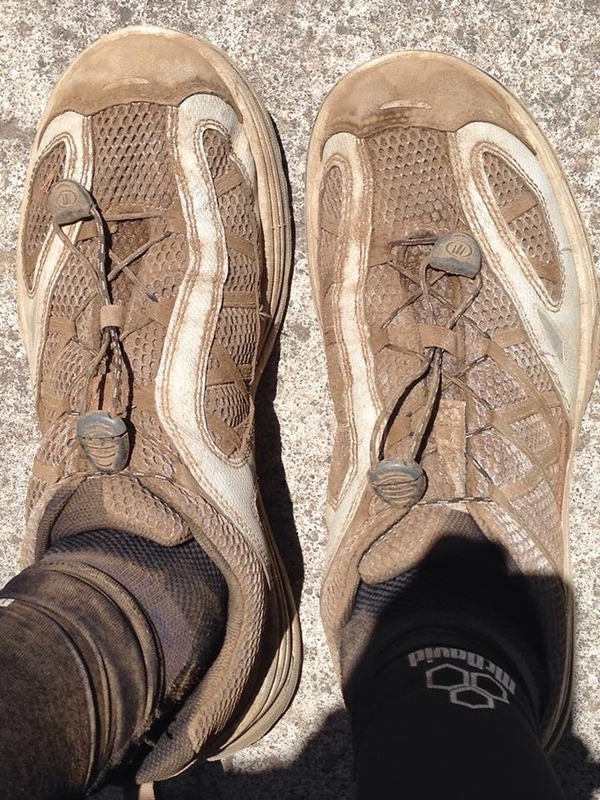 I normally run now in Hoka Stinsons but for this particular training run I went back to my default trail shoes, the Tecnica X-lites because the x-lites have a larger and reenforced toebox which was needed given all the exposed rocks and roots.